Did you know that macular degeneration and cardiovascular disease share many of the same risk factors? Risk factors like smoking, obesity and high cholesterol all play a role in both of these conditions as does inflammation and oxidation. The US Twin Study of Age-Related Macular Degeneration (Arch Ophthalmol. 2006;1 Johanna M. Seddon, MD, ScM; Sarah George, MPH; Bernard Rosner, PhD) included 681 twins - including 222 twins with AMD (intermediate or late stages) and 459 twins with no macular disease. The study looked at one's risk for AMD as it related to cigarette smoking and dietary fat intake. The results showed that current smokers had a 1.9-fold increased risk of AMD while past smokers had about a 1.7-fold increased risk. Smoking is not only associated with vision loss due to AMD but also with cataracts and optic nerve damage. Poor circulation results from oxidative damage to the cells and reduces the amount of nutrients that can be delivered to the eyes and especially the macula. 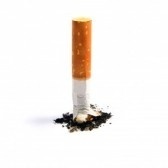 Most health professionals agree that the single most modifiable risk factor for AMD is to quit smoking.